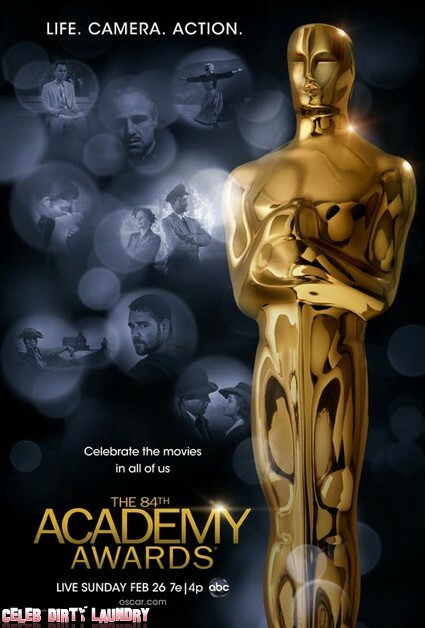 The poster for the 84th Academy Awards has arrived. The Academy of Motion Picture Arts and Sciences has gone with a classic look for 2012. The simple design highlighting past Oscar winners with the tagline ‘Celebrate the movies in all of us‘. Making a cameo on the stylish poster are big names like Russell Crowe, Tom Hanks, James Dean and Marlon Brando. There are also images from some of the classics which won a swag of awards back in the day including The Sound of Music, The Godfather, Gone With The Wind, Driving Miss Daisy and Casablanca. All under the watchful eye of that famous Oscar statue. If the poster is anything to go by it’s a return to tradition this time around. We already know the Academy has hired Billy Crystal as host. That’s a safe choice given his track record. He was the obvious master of ceremonies after Eddie Murphy dropped out. One thing is for sure – there’ll be no double act after this year’s Anne Hathaway–James Franco disaster. The Producers won’t be making that mistake twice. The nominations will be announced on the morning of January 24 at the Kodak Theater in Hollywood. The same place where the little gold men will be handed out a month later on February 26. The early favorites to get a nod include Meryl Streep for The Iron Lady, Michelle Williams for her outstanding work in My Week With Marilyn, Leonardo DiCaprio for J Edgar, Brad Pitt for Moneyball and Woody Allen as Best Director for Midnight In Paris. It’s all getting very exciting – I’m counting down to Oscar! The Girl With The Dragon Tattoo Poster Revealed…And Oh What A Poster It Is!